Want to plan a Sunday outing with family or friends or with those from out station within the boundaries of the city? Searching for a good place for an outing having some greenery, wildlife or some picnic spots? 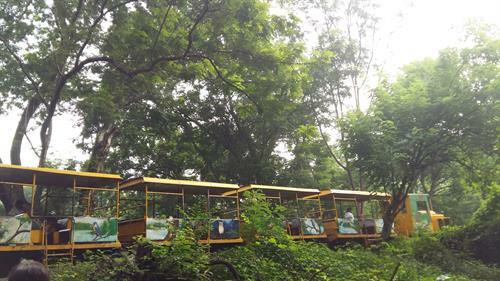 Sanjay Gandhi National Park- SGNP, an ideal place for daily walks, cycling, picnics, wild life excursions and the lovebirds who want to spend some time together. Sundays are for relaxing, going out, picnicking, partying specially for Mumbai based people who work Monday to Fridays/ Saturdays and rain their energy out traveling and working. So come Thursday and typically Mumbaikars start making plans for what to do on Sundays. A half day outing is preferable if there are weekly chores in pipeline. This is how we came up with a plan of a trip to Sanjay Gandhi National Park, called SGNP or Borivli National Park for short. I wanted to talk long walks amidst the green forest and my spouse wanted to cycle on the slopes. So SGNP turned out to be a good choice. This article is not just about the travel to the park and what we did but an informative article providing more details about the park. Join me on this journey which will take you deep into the Sanjay Gandhi National Park. SGNP or commonly called as Borivli National Park is one of the six national parks of Maharashtra located in the Sahyadri range, in the northern part of the Western ghats. The area has three ranges: KrishnagiriUpavan (is a recreational are), SGNP and Yeoor. The park is surrounded by Thane, and Mumbai. Some part of the park is in Thane and the other small portion is in Vasai creek at sea level with many mangrove patches. The Park was formed by bringing together privately owned land. The entire park area of 104 sq kms comprises of three parts: recreational area, buffer area and the core area. This park protects Vihar and Tulsi lakes and supplies water to parts of Mumbai. Did you know that Mumbai is the only city in the world which encompasses a National Park? SGNP is a global diversity hotspot. It houses rare, nearing extinct and beautiful 286 species of birds, more than 150 species of butterflies, many leopards and 15 species of orchids. The flora identification was carried out by BNHS, Agharkar Research Institute Pune and Blatter Harbaria. The forest is tropical, dry deciduous, or southern dry deciduous and dominated by teak and bamboo trees. The entire park is protected under the Forest Conservation Act of 1980. Adivasis work with the forest Department to protect the flora and fauna. An entry into the park is reasonably priced and offers daily pass for regular walkers and cyclists. It opens around 6 am for pass holders and at 7.30 am for the day visitors. What to do in SGNP? Kanheri caves will be covered in a separate article. Overall ample things to do, and enjoy at SGNP, for a few hours upto the whole day. Recently Tungareshwar is declared as a wild life sanctuary and is included in SGNP and these two together make a corridor to allow animal movement from one environment to another which increase genetic diversity and health. A few issues in SGNP are handled by the Forest conservation Department and are still ongoing like the forest fires, illicit activities like heavy drinking, sound and emission pollution, festivals like Ganapativisarjan, Mahashivratri and illegal encroachment and human animal conflict among the leopards and the Adivasis tribes residing in SGNP. SGNP has improved in terms of the look, cleanliness, the signboards, the trails, the roads etc. but this place still has a long way to go to come up to international standards. To formally close if you are in Mumbai then pay at least one visit to SGNP and see the greenery, flora and fauna amidst the remaining concrete structures of Mumbai. Enjoy! Sanjay Gandhi National Park is the only national park inside the city which is well maintained. If you are planning to make a visit to SGNP, You must go for cycling ride, you can hire cycles from the main gate. A ride through lush green forests at morning will make your day best. Mumbai city is so congested and is situated in an island (almost). But, one better thing is so much greenery and the forests around the region. Sanjay Gandhi National Park needs to be more projected in medias so as to gain more weekend tourists from the city and Poona. I hear that wildlife is creeping the people living on the periphery of Sanjay Gandhi national park?